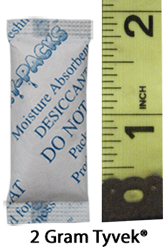 2 Gram Silica Gel Packet (Tyvek®) is used to absorb moisture and prevent Mold, Mildew, Corrosion, and Fogging. The 2 gram silica gel packets weigh 2 grams. Dimensions are about 2" x 13/16" in width. Silica Gel packaged in Tyvek® meets FDA specifications and is the industry standard used in dry food packaging.